NEW BRUNSWICK — A Rutgers history professor who wrote on his personal Facebook page that he hates white people could face action from the university. 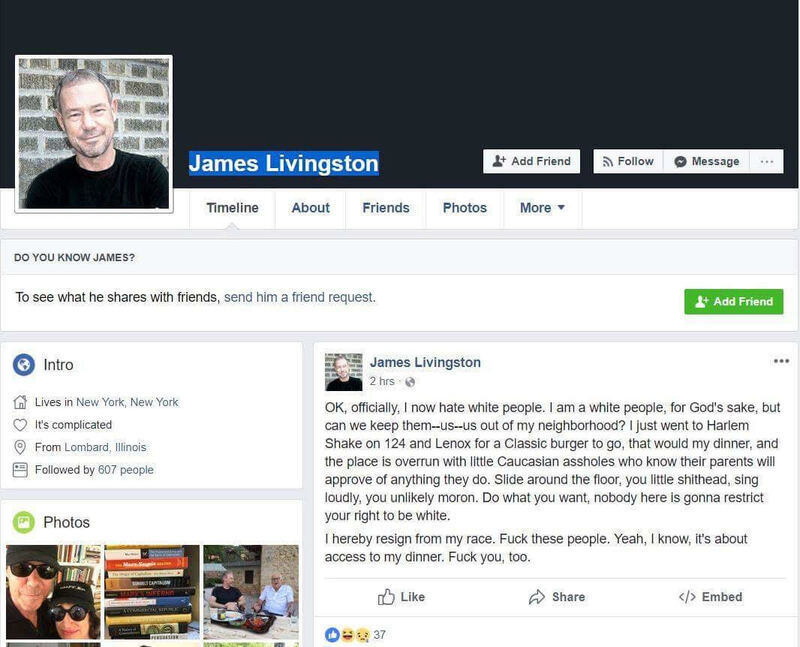 James Livingston, who is white, wrote that he resigned from his race triggered after encountering unruly children at a Harlem restaurant. "Slide around the floor, you little shithead, sing loudly, you unlikely moron. Do what you want, no one is going to restrict your right to be white. I hearby resign from my race. F**k these people. Yeah, I know. It's about access to my dinner. F**k you too." He said Facebook removed the post but he repeated some of his points in a second post. "I just don't want little Caucasians overrunning my life, as they did last night. Please God, remand them to the suburbs, where they and their parents can colonize every restaurant, all the while pretending that the idiotic indulgence of their privilege signifies cosmopolitan--you know, as in sophisticated 'European'--commitments." The conservative news site Daily Caller posted a screenshot of the initial post. In a statement, Rutgers University said it is investigating the matter. "There is no place for racial intolerance at Rutgers. This matter has been referred to the appropriate leaders at the Rutgers-New Brunswick campus, where Dr. Livingston teaches, to determine whether his comments violate university policies prohibiting discrimination and harassment," the school's statement says. Livingston received mostly "average,"good" and "awesome" reviews on RateMyProfessors in reviews going back 10 years. "If you enter this class to learn about history, you'll be disappointed. I didn't understand anything he talked about with all of his tangents," according to a student review in 2017. A student in 2012 wrote, "He does care about his students and tries to make lessons interesting and interactive. Occasionally far too quick to follow when taking notes, and sometimes I wondered if he was high, but he is a phenomenal and effective lecturer and teacher." "Cool guy, very smart when it comes to the economy and history of it..just couldn't stand his extreme left-wing borderline socialist views. if you're moderate to Republican, he is somewhat intimidating and will act as if his opinions better than yours..but other than that he's a really smart, cool guy and once the election was over I enjoyed class," a student giving a "good" rating wrote in 2008.